Two ancient civilizations come together! This CD proves to be the most dynamic Greek - Iranian musical combination of three top soloists who live and create in London. The Greek Matthaios Tsahourides, on the Pontiac lyre and the Iranians Ardeshir Kamkar on the Iranian kamancheh (Persian lyre) and Hussein Zamawy on the Kurdish daf and daireh, communicate musically and in a language which knows no limits and boundaries, but recognizes only sounds. 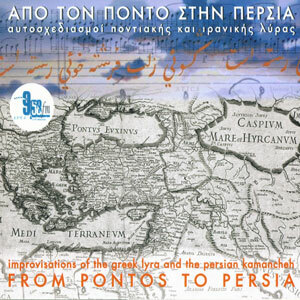 The result of this gathering is the composition of Greek and Iranian traditional music in an excellent way.